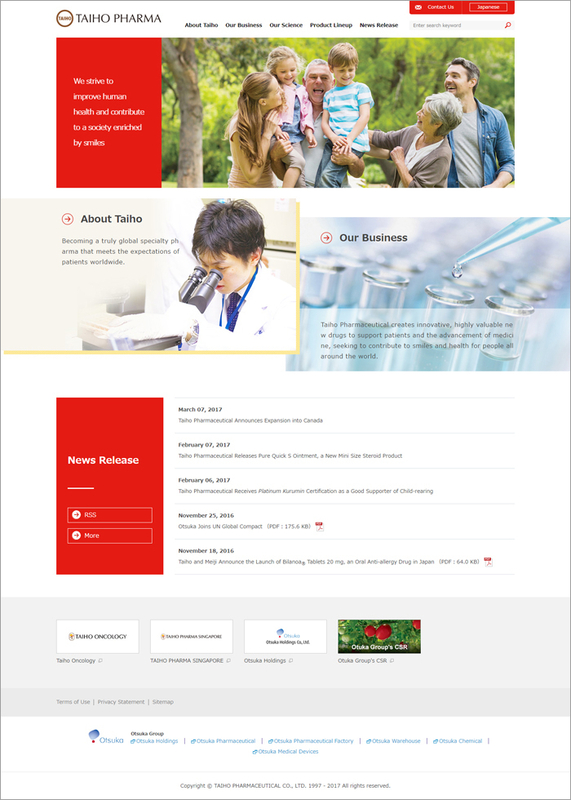 Taiho Pharmaceutical Co., Ltd. announced today that it has completely redesigned its official website. The new design employs the Taiho Group’s corporate colors: Taiho Red, Taiho Sepia, and Taiho Yellow. By refreshing the design to create a sense of unity, the company sought to strengthen its corporate branding. Taiho Red the key color, conveys energy, vitality, and dynamism. The company made the site easier to read and navigate by using responsive web design, which automatically adjusts the layout to fit the screen size of various devices, such as smartphones and tablets. By enabling always-on SSL,* which provides stronger security, the company has improved the site’s reliability, to offer a site that can be used with greater peace of mind. * “Always-on SSL” is a security method that applies HTTPS (SSL/TLS encryption) to all pages of a website. Encryption prevents contents from things such as falsification. Taiho Pharmaceutical will continue to strive to make the information it provides at its website more accessible and easy to understand.